This month's #SHOESHINE is open to those who want to bare their "soles" and share their light. I've been quietly busy, photographing and listing on eBay and Etsy. I might seem M.I.A. (Missing in Action) and yet not really. There's a lot of action- I'm not away on vacay, or taking a "breather" but rather doing what I should have been doing this whole time, and focusing on creating a viable business and livelihood for myself. However, the party goes on, and if you care to put your best foot forward please do so by adding a link to you in the shoes that make you feel like a star. 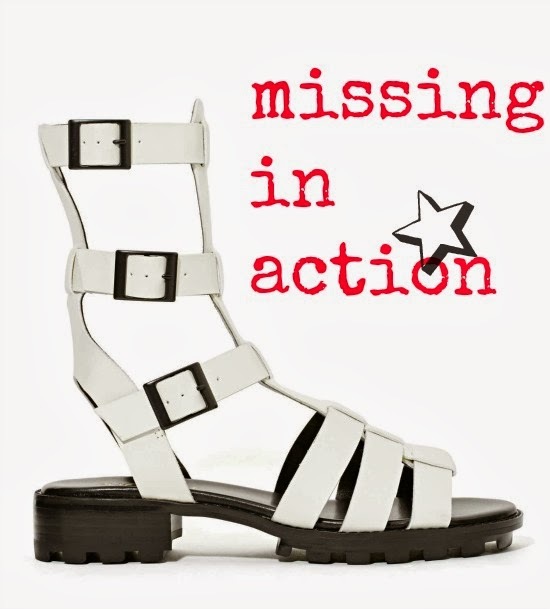 I've been admiring the new chunky lug soled gladiator sandals that have been showing up- my faves come from online venues such as Solestruck, and Nasty Gal. These ghostly numbers are a Nasty Gal exclusive and filling up my wishlist, for just $88. As always, SHOE SHINE is open to all. See you on the upside. I was just thinking about you this morning and that I hadn't seen you post in a while. Glad to hear it's for good reasons! Cool gladiators...glad to see the trend hasn't faded. Totally loving Une Femme's shoes!!! So glad you still opened your Shoe Shine - I can always use a polish! Or maybe not since I'm wearing suede in my picture. There are some pretty tasty photos on this post. God, I want to buy more shoes! Those sandals are to killed for! Happy that you are doing well! So glad to see your still on for your monthly shoe shine. It's always a highlight for the month, especially to see what the ever so fun Bella will be footing around in.